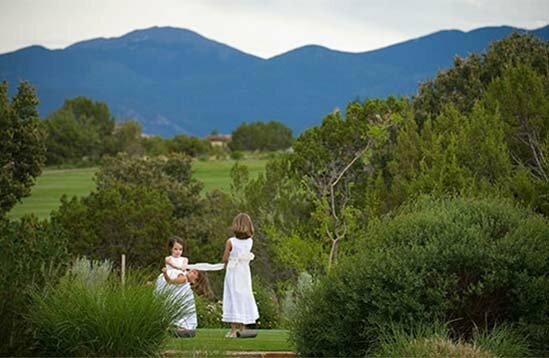 The Club at Las Campanas hosts many family activities throughout the year for our members and their guests. From a fun-filled Memorial Day Pool Party and BBQ to a spectacular Fourth of July Celebration, the Club offers many events. Generations of family members come together to enjoy our holiday traditions year after year. Give your child a summer filled with greatness – great fun, great friends, great experiences – within an incredible Club environment! Activities include swimming, tennis, golf and more! Summer fun with horses! Our fun-filled camps are designed to give riders a solid foundation in horsemanship basics in a safe and enjoyable atmosphere. Our specialized teaching methods reach out to children on their level and instruct in all aspects of proper play in a fun and creative manner. With a teacher-student ratio of 6:1, each of the Junior Golfers will receive ample individual and group instruction from Las Campanas’ Professional Staff. The Junior Tennis Program aims to instill a love of the game amongst our younger members via a supportive and positive environment. Basics of the game as well as court etiquette and scoring are integral parts of the instruction, all in a fun atmosphere.